Kylie Murphy lifts the Continental Tyres Women's Senior Cup in 2015. KYLIE MURPHY KNOWS both ends of the emotional spectrum when it comes to major cup finals at the Aviva Stadium. The Wexford Youths captain was instrumental in her side’s dramatic penalty triumph over Shelbourne in 2015, but was also present when her team suffered a humiliating, heartbreaking 5-0 defeat a year later. The skipper scored in the shoot-out three years ago and duly hoisted the trophy high in the air as she and her team-mates basked in the glow of their FAI Continental Tyres Women’s Cup success. She was suspended for the five goal drumming in 2016, but felt every ounce of pain alongside her team-mates walking off the pitch with the taste of defeat lingering bitterly. On Sunday morning Murphy will be on the team bus driving up Landsdowne Road for the third time in four years. Her mission is to banish the demons of their last appearance at the national stadium, while seeking to reclaim that same feeling of euphoria as 2015 when Wexford notched a 95th minute equaliser before winning the game on spot-kicks. “The 5-0 was embarrassing, it was demoralising,” she says casting her eyes out over the Aviva Stadium surface, which is being slowly prepared for this weekend’s two cup finals. For me, I found it very hard sitting in the stands being suspended. Whatever about us getting bet, but to see the girls’ faces and not be able to help them just absoutely killed me. “They were just broken and it took us a while to get ourselves back on track. It took a while to start believing in ourselves again, but eventually that feeling did return and we knew all along that if we got a crack at another cup final that we would give it a good lash. Peamount are the bookies’ underdogs heading into the game. Wexford Youths claimed their fourth league title in five years in 2018, finishing nine points clear of their Dublin counterparts having lost just one league game all season. With all that said, Peamount boast an incredibly impressive squad littered with current and former Ireland internationals like Amber Barrett, Aine O’Gorman, Heather Payne, Claire Walsh and Karen Duggan, among others. It is the Peas’s first FAI Women’s Cup final since 2012 and their very first since the finals started being played at the Aviva Stadium in 2013. Murphy knows the threat that Peamount pose and is taking nothing for granted. Wexford Youths have lost just two domestic games all season, one league outing against Shelbourne and a League Cup final against Sunday’s opponents. The club have enjoyed a incredible litany of success over the tenure of three different managers in recent years. Birmingham-born manager Tom Elmes secured the club’s fourth league title in five seasons this year, with Sunday’s match their third cup final in four years. “You just keep fighting and you don’t let the bar drop,” captain Murphy says on maintaining success year after year. “There’s a core group of senior players that’s been here, myself and Nicola Sinnott and Edel Kennedy, and we’re reluctant to let our standards drop. We just demand more of ourselves and demand more of the management each year. A carpenter by day, Murphy says that working alongside her father and brothers making products like fitted kitchens, wardrobes and TV units is almost like a training session it itself. “I feel like I’ve done three gym sessions in a day’s work alone by the time I get to training afterwards,” she laughs. The 30-year-old admits it is a long and gruelling season, competing in the Women’s National League, League Cup, Women’s Uefa Champions League and Women’s FAI Cup alongside work commitments. But the taste of success and enjoying big occasions like Sunday’s at the Aviva Stadium makes it all worthwhile. She insists that she and her team-mates have not forgotten the pain of the last time they left this pitch. Suffering a host of injury setbacks and with Murphy herself suspended, Wexford could do nothing as a 17-year-old Leanne Kiernan netted a hat-trick en route to a 5-0 win for Shelbourne. It feels like we let ourselves down,” Murphy says. “Who wants to be bet on telly 5-0? On live TV when you know you’re so much better than that. That was rough. And we had only just come from winning the treble the year before. In August Murphy scored a sensational winner in Wexford’s Champions League qualifier clash with Linfield, securing a 3-2 victory with the very last kick of the game. Her side certainly have bounced back from the scars of their last final defeat. With four league titles in five years, three cup finals in four years, earning the right to play against sides like Dutch giants Ajax in the Champions League up in Belfast earlier this year, and the chance to secure a league, shield and cup treble in 2018 — the club has motored on through good times and bad all the while hoovering up trophies year on year. They are firm favourites heading into this weekend’s clash against Peamount. Murphy knows what it’s like to walk up the steps at Landsdowne Road and hoist the cup high in the air, but is taking absoutely nothing for granted against a Peas’s side which has already beaten them in a cup decider this season. “I’m expecting a battle,” she says. “They have phenomenal players: the calibre they have is just immense all over the pitch. Their strike force is strong, their defence is the same, they are just strong all over. So we’re expecting a battle. 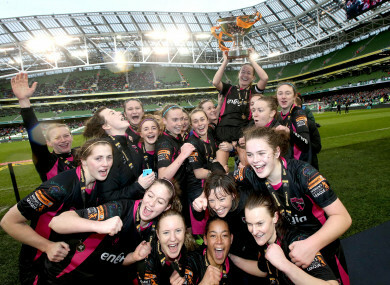 Wexford Youths have won back-to-back Women's National League titles in 2017 and 2018. There is one final glance across the Aviva Stadium surface as the skipper surveys her horizons leaning forward in her seat. ”It’s phenomenal,” she smiles. “You’d get goosebumps just looking at it.” By Sunday lunchtime she will surely know it like the back of her hand. Email “'Losing 5-0 on telly was demoralising... but we knew if we got another crack at a cup final we'd give it a good lash'”. Feedback on “'Losing 5-0 on telly was demoralising... but we knew if we got another crack at a cup final we'd give it a good lash'”.